Mulberry trees are a very popular choice and always sell out before the end of the season (August). If we are sold out you can still purchase one now for guaranteed delivery when the growing season starts again in August. The black Mulbery has quite a history! It is derived from a tree that existed in Swan Walk in the 17th century, now known as the Chelsea Physic Garden, during the time of King James 1. During the 1939/45 war the last remaining tree was about to be grubbed to make way for an air shelter when cuttings were taken and this tree has survived ever since. So indirectly, you would be growing a WWII veteran! 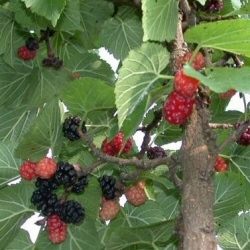 King James (Morus nigra 'King James;), also known as the Chelsea Mulberry, has mulberries which are unusually large in size and succulent fruit cropping early in life. With an intensely rich flavour, it is a real favourite. Add sugar, microwave and pour over ice cream! The black mulberry also makes for an attractive ornamental tree especially as we sell them as Half - Standard trees which means they have been pruned early on in their growth to provide a very ornamental tree shape i.e. more lollipop shape. The King James Mulberry tree has quite a wide shape often growing to be slightly wider than it is tall. Expect it to be long lived and reach a height of around 12m with a possible width of 15m. This is all subject to local conditions and weather and with the phenomenon of sinkholes becoming more prevalent in the UK, don't complain to us if your tree height goes into negative numbers. As your King James tree ages expect the branch structure to become gnarled and twisted which can be very attractive. Picking Mulberry fruits can be a messy business so for cleaner fingers and clothes, try placing a sheet under the tree and shaking. The perfectly ripe Mulberries will fall. Daily harvesting is recommended. 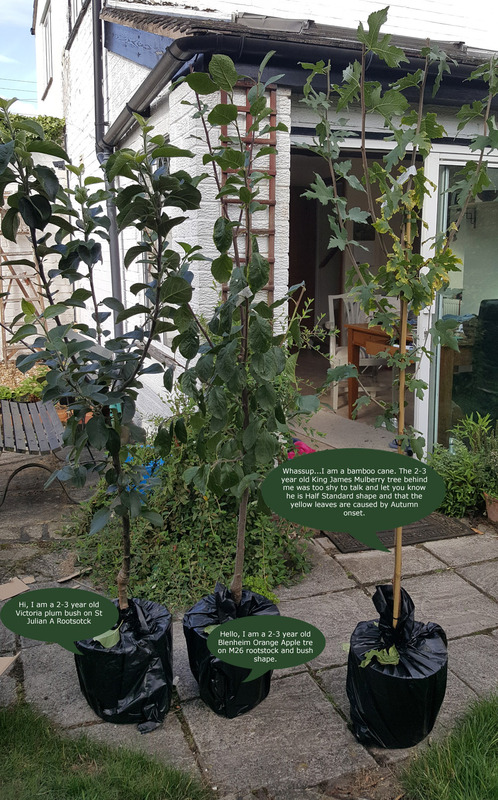 The Chelsea King James Mulberry is tolerant of a wide range of soils and can be grown against a wall if space is limited but do remember the ultimate height and spread if you choose to do this. It will perform better in deep, well draining soils however not so well draining that you have to constantly water. If you have heavy clay mixing your soil with 50:50 compost or well rotted manure is a good option and the same applies if you have very sandy soil. Should your site be particularly windy then consider staking for the first few years until your Mulberry tree is established. Despite its ultimate large size, you can grow Chelsea King James Mulberry trees in pots for up to 15 years providing that you water and feed especially in the Spring and Summer. The largest possible pot you can give it is the easiest option for you as it will not need feeding or watering so often. We use 110 litre pots for our most mature fruit trees but they require 2 average people to move them unless you have a trolley. Feeding your King James Mulberry could consist of a general purpose tree fertilizer in late winter and organic mulch in Spring. Your local DIY store will also have liquid or granular feeds that can be easier. Pruning your Mulberry tree is best carried out in the Autumn. Allow around 4 weeks after leaf fall before you start chopping branches off. You definitely want to cut out the diseased, dead and crossing over branches but also consider those that crowd other branches. The more light and air you can get into the centre of the tree the healthier it will be. A good rule of thumb is if a light wind is going to cause branches to rub against another then it could cause you problems in the future. Any small branches, suckers etc that grow below the main canopy of the Mulberry, especially near the roots can and should be removed as they are not going to amount to anything. Some of the lower branches may need supporting to prevent them from breaking under their own weight. If they do, these can easily be pruned out. If you want Mulberries quicker and don't have the patience to wait then try the Jerusalem Black Mulberry Tree or the Wellington. Fruits in the first year and has an amazing velvety taste. Previous customers have commented on fruiting times and soil type seems to be deciding factor. Chalky soil and sheltered gardens meant one customer only had to wait around 5 years for it to start fruiting. Self-Fertile/Not Self-Fertile: King James is a self-fertile Mulberry, so there is no need for another Mulberry to aid pollination to get fruit. We have 2 options for this tree usually, the 7 and the 12 litre pot. They are both the same age of tree with the only difference being that the 12 litre pot has been pruned to be a half standard shape. This means that there is a section of clear trunk giving it a more ornamental shape. Also, the 12 Litre option is most likely to be taller and slightly thicker than the 7 litre option. If one option is not listed, it will be because we are out of stock.